In the days after the 2008 presidential election, we heard that Sarah Palin thought Africa was one big country. We heard that the leak came from Martin Eisenstadt, a McCain policy adviser. And then, within forty-eight hours, we heard that he was a fraud, a fake, and that Martin Eisenstadt didn't exist. Maybe he doesn't. But in a world where "news" can spread like wildfire on the Internet and a hoax can tell you more about politics than the facts, Martin Eisenstadt—whose blog and think tank fooled the world—has something to tell us. With the savviness of Primary Colors and the playfulness of Forrest Gump, his book is a mix of political intrigue, campaign-trail escapades, and cyberspace detective work. From debate preparation with Sarah Palin to his mother's basement (yes, he still lives at home), from Liberation of Iraq softball games to Saturday Night Live; from his campaign for casinos in the Green Zone to happy hour in Washington, we follow a neocon pundit on his travels. This is his version of the election campaign. Martin Eisenstadt: Hoaxster? Hero? You decide. 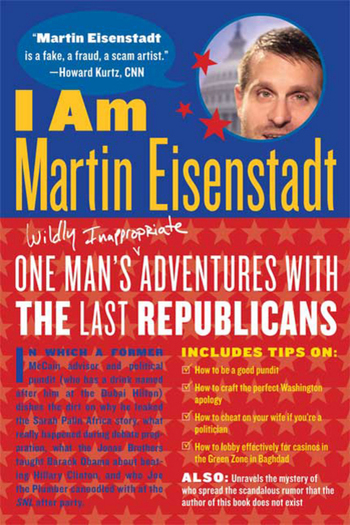 Marty tell America about his new book, coming out on the one year anniversary of the historic 2008 presidential election. The political strategist and conservative analyst Martin Eisenstadt is a senior fellow at the Harding Institute for Freedom and Democracy and founder and president of the influential Eisenstadt Group. An expert on Near Eastern military and political affairs, Mr. Eisenstadt worked alongside Senator John McCain's presidential campaign, offering advice and liaising with the Jewish community in particular. Prior to that, he consulted on the Rudolph Giuliani campaign, as well as for numerous corporate and multinational organizations on issues of security and policy development. Mr. Eisenstadt has been an influential voice in public policy debate for over a decade. By the time you read this, he will have his own place and will not be living in his mother's basement.